FCU English Online: Find A Place To Live! Freshmen here at Feng Chia University (FCU) are required to live in a university dormitory unless their homes are in Taichung. As you might have read in a previous FCU English Online article, each of the 4 dormitories has special characteristics that make it different from the others. However, when they become sophomores, FCU students often need to rent a place of their own so that newcomers can have rooms in the dorm. Let’s look at the pros & cons of renting outside FCU and the things that you might considered as you search for your new “digs.” Get your things packed and get ready to move! For most students at FCU, it is quite common to rent an apartment with good friends or a suite by yourself. While dorm life does have some benefits like safety and convenience, it also has its drawbacks, such as sharing a bathroom with roommates and having to return before a deadline at night. On the other hand, some think renting outside campus is a chance to be independent, and in my opinion it really does give you more freedom. Renting a place on your own gives you the opportunity to deal with your daily life without assistance from parents and school. However, you have to remember that everything that needs to be done has to be done by you, and that the rent is a bit higher than in the dorm. If this is your first time renting a place, there are a few things you should be clear about. First, you have to decide to live with roommates or not, depending on how much privacy you need. This directly determines whether you rent a multiple-room apartment or small studio. Beside these two options, there are bedsits (sharing bathrooms), suites (with personal bathrooms), single-room apartments, and three-floor houses near campus. Prices for these options can vary from three thousands to ten thousands NT dollars a month. Therefore, it is also important to know your budget. After your budget and the number of roommates are certain, you should be clear where to start your search. Other factors you should consider are location (how far from school) and neighborhood facilities like convenience stores and recreation facilities. After understanding your requirements, there are a couple ways to find your ideal place. One way is to literally walk down the street and watch for advertisements/signs attached to building walls, doors, or even windows. House owners used to put their “For Rent” signs in eye-catching positions. This may sounds kind of time consuming, but you can personally check out the neighborhood in a more detailed way. 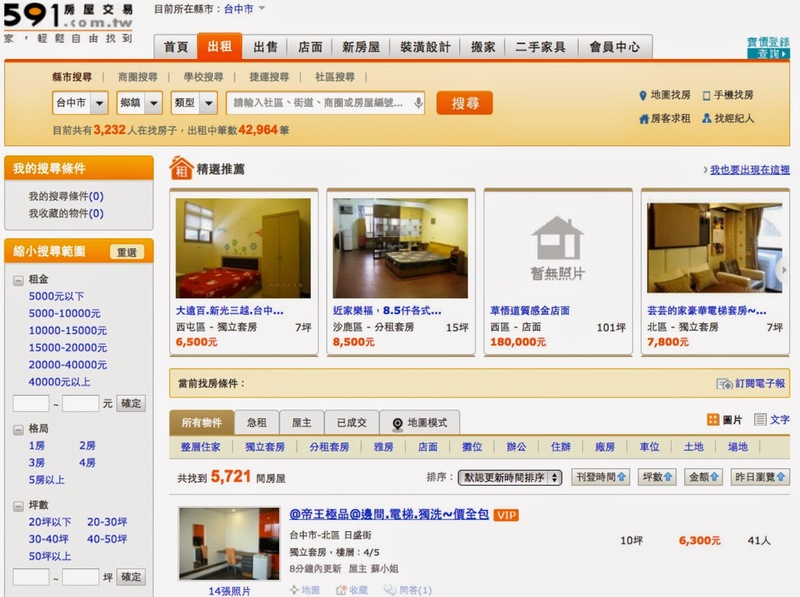 There are also some websites (like the one pictured above) that provide user-friendly platforms for landlords and renters. Most of the websites charge their fees to the landlords, so you don’t have to worry about paying an extra cost. These websites usually require that the owners post the price, location, indoors facilities, basic rules, and pictures of their rentals, so you can get a general idea about the place and then contact the owners for further details. Moreover, there is a school office here on campus that publishes rental information regularly on their bulletin board. Since these rentals have been inspected by school personnel, students can obtain the info quickly and safely. Finally, asking your classmates about places they have been living in another quick start. Renting your own place can be enjoyable. You will not only become more independent and responsible, but you will also get to choose your ideal living environment. After all, why not have a better choice if you are able to? Just make sure the place you choose is both clean and safe.